Plan showing one of John Evelyn's garden designs at Sayes Court. At Sayes Court in Deptford, Evelyn put his theories into practice and produced one of London's greatest gardens. Though now long lost, we can rediscover the garden in minute detail thanks to a plan drawn up to Evelyn's instructions when he first began to lay out the garden in the early 1650s. It was "the guide of all our designs". 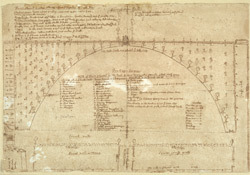 The meticulous plan, provided with a key describing every feature, gives a unique and vivid evocation of the garden one contemporary called "the little world that goes under the name of Sayes Court." It was first intended to communicate his ideas for the estate to his father-in-law, but the detailed nature of the plan suggests that Evelyn also had publication in mind. This drawing shows that after the very severe winter of 1683-4, the layout of the south-west part of the Sayes Court garden was much simplified. The former parterre was converted into a semi-circle of lawn and the quadrants planted with fruit. The varieties are listed in this plan of February 1685 by Evelyn include cherries, pears, apples, plums apricots, vines, figs, gooseberries and strawberries. Low growing fruit was also planted along some of the walkways: "a very private passage out of the oval neich into the walke" was planted with "dwarfe fruit. Raspberries, Strawberries, Currants & Cherries..."
Find out much more about John Evelyn in our Lost Gardens feature.